On July 2nd 1914 BLAST, Wyndham Lewis’s Vorticist’s literary magazine, was first published. 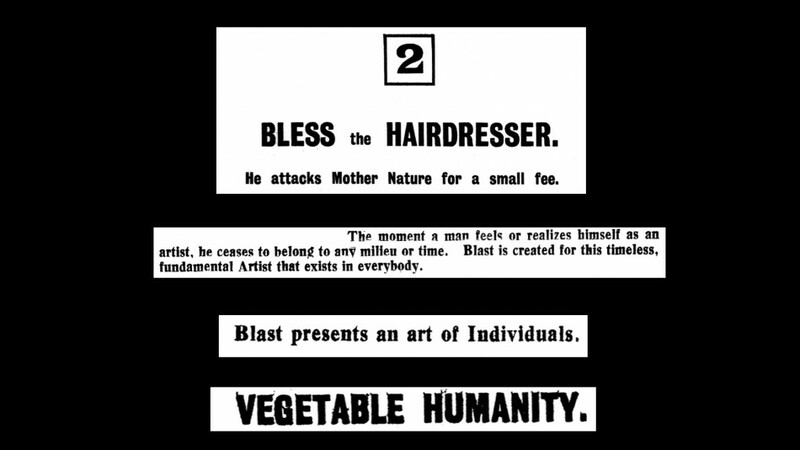 Blast Theory’s name comes from the manifesto found in the magazine, where the Vorticists name a long list of things that should be ‘Blasted’ and things that should be ‘Blessed’. Being the publication’s 100th year anniversary I took the chance to read through the magazine and ask Matt a few questions I got curious about. The magazine’s visual style; bright pink cover accompanied by what feels like quite a modern graphic design, paired with its humours rant-like content and inspirational poetry, all make for a fascinating read. LW: Where did you first encounter Blast publication? What drew you in to it? MA: There was an anarchist fanzine published in London in the 80s called Vague. It had an updated list of Wyndham Lewis’s Blast … and Bless … and that led me back to the source. In my memory the Vague list included “Blast Theory Bless Practice” but when I looked recently I can’t find any such reference. I must have made it up. LW: Are there any specific works by Blast Theory that were directly influenced by Vorticism? MA: There’s no direct link with a piece of work but the history of subversive counter cultural movements created by artists starts there in this country. Greil Marcus tracks the history of punk back to Dada and Wyndham Lewis was in that iconoclastic tradition. We were heavily influenced by the DIY aesthetic and the breadth of vision that you see in so many of those movements. And the graphic design remains eye popping to this day so we definitely stole from that. LW: What are your favourite bits from the ‘Blast’ and ‘Bless’ parts of the publication and why? BLAST HUMOUR, quack ENGLISH drug for stupidity and sleepiness. BLESS ENGLISH HUMOUR, It is the great barbarous weapon of the genius among races. It’s always great to have a good contradiction and the language is so splenetic and inventive. LW: If you would have to add any current ‘Blast’ and ‘Bless’ what would they be? LW: How relevant are Blast and Vorticism in today’s art world? MA: I can’t speak for the art world; we are peripheral to that but Blast has enduring power because it has chutzpah, great ideas and an uncompromising aesthetic. Anyone stumbling on a copy can see just how exciting it is at a glance. Vorticism as a movement seems pretty minor: it was overshadowed by Futurism and never achieved escape velocity from Lewis’ orbit. Its particular significance is that it was an English form of avant gardism and we haven’t gone in for that much. LW: Do you think that if the first publication came out after the war it would have had a longer lived/greater impact, would it still be as relevant to that post-war society? MA: It’s a thing of beauty and brilliance lovingly enjoyed by thousands a century after its first publication: I think its done pretty well for impact!